Rising to 5636 meters, Pico de Orizaba is Mexico’s tallest peak, and North America’s third tallest. If you’re interested in learning how to climb Pico de Orizaba, you’ve come to the right place. The info in this post covers climbing the mountain from the north side independently (without a company providing transport/food/lodging). I climbed solo on the mountain, but if you’re inexperienced it is a very good idea to climb with a guide. While many sources on the internet call Orizaba an “easy” mountain, it’s still a 5500+ meter glaciated peak. Two days before my attempt on the mountain three people lost their lives. Pico de Orizaba is a great mountain for people who are fairly new to mountaineering. It’s a non-technical climb but requires the use of crampons and an ice axe. At 5,636 meters, Pico de Orizaba is North America’s third tallest mountain after Denali in Alaska and Mt. Logan in the Yukon. Due to its altitude, you’ll need to get acclimatized before attempting a summit bid. 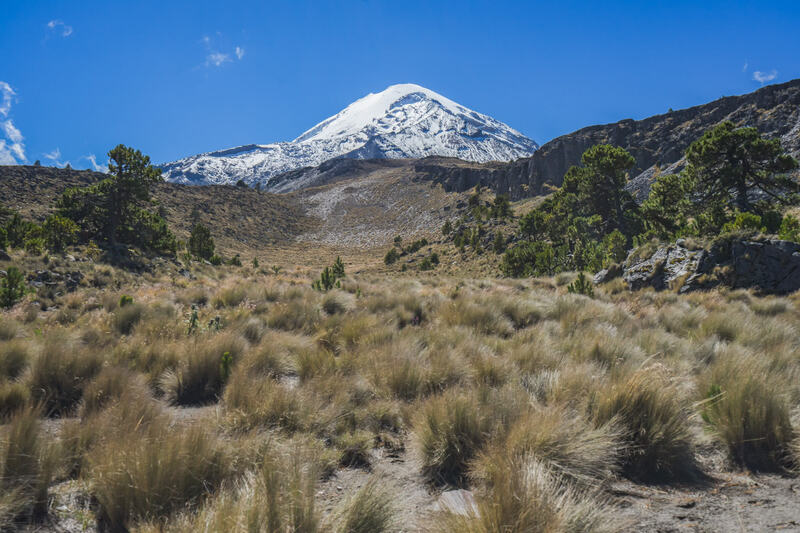 The most common way to get acclimatized is to climb some of the smaller volcanoes nearby. I climbed La Malinche (4,461 meters) for acclimatization, but another popular option is Iztaccihuatl (5,230 meters). Typically, an ascent of the mountain will take two or three days (departing from the nearby town of Tlachichuca). The base camp of the mountain accessible by road (need a 4wd jeep), and is at an elevation of 4,230 meters. If you’ve already acclimatized on another nearby mountain and are feeling good after arriving at base camp, it’s possible to attempt the summit the next day. Most summit attempts will begin between 12 am and 3 am depending on climbers speed. You’ll summit sometime in the morning, and can then descend back to basecamp and get picked up for the drive back to Tlachichuca. The closest city to Pico de Orizaba with an international airport is Puebla, but Mexico City is only about two hours further and has a lot more flight options. From Puebla, it’s a two-hour bus ride to the small town of Tlachichuca. From Tlachichuca, you’ll get your first good views of the peak as it looms over the town. There are a number of bus companies running the route from Mexico City to Puebla, and it’ll cost you about 150 pesos one-way. You can catch a bus from the international airport or the TAPO station. To Tlachichuca, buses leave from the Puebla CAPU station every hour, and the ride will take approximately two hours. From Tlachichuca, the Piedra Grande Hut is a two-hour drive on a very rough road. There isn’t any public transit going up there, so you’ll need to hire a vehicle. Make sure that you’ve done some acclimatization before heading up to the hut, as it’s at an altitude of 4,230 meters. 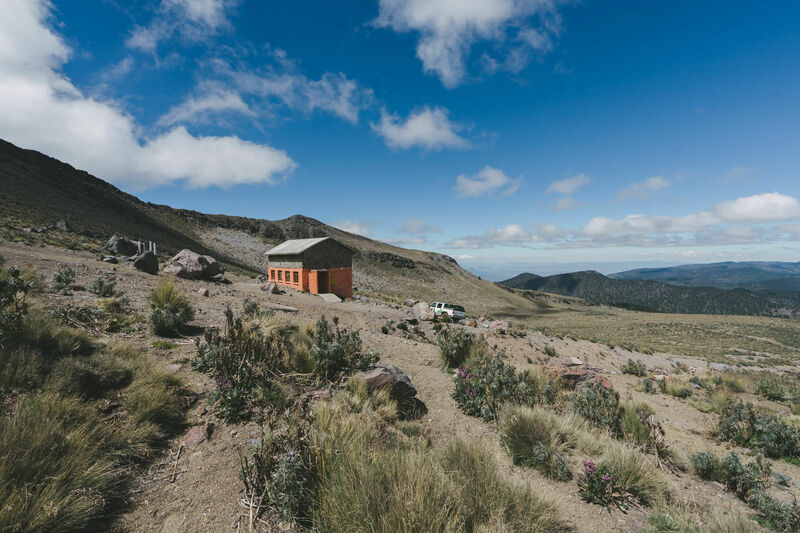 Fortunately, Tlachichuca has two well-established guest houses offering accommodation, gear rentals, and rides to the Piedra Grande Hut in 4wd vehicles. I stayed with the Cancholas and had a great experience. They have a great guest house, and Mirabel cooks wonderful food. You can also consider going with Servimont. Expect to pay around $200 USD for accommodation, food, and transport. I should preface this with a note that I didn’t manage to summit – I made it to within 100 meters of the summit before turning back. More on this later. Assuming that you’ve done some acclimation prior to arriving at the hut (I highly recommend a day hike up La Malinche – blog post coming soon), I would recommend attempting a summit on your first night at the hut (if the weather cooperates). I recommend this because the longer you spend at the hut, the weaker you will get. At 4230m, you’ll likely lose most of your appetite and have difficulty sleeping. From the hut to the summit it’s a vertical gain of about 1400 meters. Quite a lot for a single summit push at this altitude. Consider your typical climbing speed and try to choose a start time – the guides I met in the hut recommended starting at 12 am, and for me, this was far too early and one of the main reasons I turned back. If you would consider yourself a “fit” climber, I’d say 3 am would be a good time to start. You want to be somewhere around the base of the glacier at sunrise. There are three main sections of the climb, I’ll go over them below. The first few hundred meters of the climb are the least enjoyable. Leaving the hut, you’ll follow an old concrete aqueduct to the base of a rocky and sandy slope. There’s a number of trails weaving up this part, just stick to the one that looks most defined. Be careful, a lot of the rocks aren’t very stable. Getting through this part of the climb won’t take too long, and before you know it you’ll start seeing snow (depending on the season). The infamous part of this climb is the labyrinth, a confusing maze of ice and rock. During my climb, there was quite a bit of packed snow/ice on the labyrinth, so there were footprints I could follow. There are two main routes up, a steeper path on the right (looking up), and a more gradual but windy one on the left. I took the steeper route up as I felt confident climbing it, but there were a few parts that were a bit more technical than I had expected. I chose the left (right going down) route on my descent, which was a good idea. I’d recommend the less-steep route both ways unless you want a bit more of a challenge. Depending on the amount of snow/ice, you’ll likely have to put on your crampons at some point while in the labyrinth. The glacier is definitely the most straight-forward part of the climb, you basically just need to keep going up. Its size is very deceiving, and you can feel like you’re making very little progress without much to use as a reference. The top part of the glacier is fairly steep at 40 degrees. My climb was going great – my acclimatization plan had worked well, I had lots of energy, and was climbing at a good pace. About halfway up the Jamapa Glacier, it started to get very windy and cold. I figured that the sun would come up soon and warm me up. I checked the time on my phone, and it was still a lot earlier than I had thought – 4:45 am. The sun wouldn’t come up for another hour and forty-five minutes. I kept climbing but took a few 5-minute breaks to wait for the sun. I was now about 100 meters from the summit and very cold. The winds didn’t let down, and when I checked my phone again it was still only 5:30 am. I decided that I didn’t want to try and push to the summit and wait around at the top for the sun to come up, as it would likely be even windier up there. I decided to turn back. When I got to the base of the glacier at 6:30 am the sky began to get lighter, and the wind went away. On my next attempt, I’ll start my climb at around 2:30 am rather than 12:30 am. I think starting too early was my only issue – if the sun had risen earlier or I had climbed more slowly, I think I would’ve made the summit. Pico de Orizaba is most commonly climbed during Mexico’s dry season, which lasts from November to March. I climbed in late October and had good weather. It’s also possible to climb the peak in April or May, but there will likely be more snow on the upper parts of the mountain. When climbing, I recommend an alpine start. In the afternoon, clouds often form and it’s best to not be on the mountain at that time. If you arrange your transportation with one of the outfitters I mentioned earlier, they’ll likely provide you with a large 20L bottle of water to use at the Piedra Grande Hut. Otherwise, you can buy these large bottles in Tlachichuca. For food, you’ll have to pick up some stuff in Tlachichuca and bring it with you to the base camp.